Buy a Big Bear Trail Map! - Big Bear Mountain Biking Trail Guide Maps GPS - Hiking Trails too! 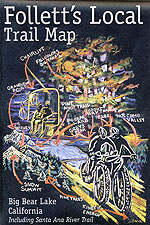 Check out BigBearBiking.com to buy the best folding trail map for Big Bear Trails. This map is available to purchase at the Bike Shops and various retail shops around town.